On the 1st April 1993, the Hong Kong Government Flying Services were created as a follow-on to the RAAF (Royal Auxiliary Air Force). Previously, the RAAF had only a badge and no flag. This badge was replaced by another badge, very similar to the one depicted on the images I post today, with the exception that the letters 'GFS' were in-chief as opposed to the Bauhinia flower and A Cantonese inscription appeared immediately below this. The name 'HONG KONG' was also inscribed upon the crimson band at the top of what appears to me as an ellipse, rather than circular in design. The wings on that badge were shaded light blue instead of the present white. On the 1st July 1997, the Hong Kong Government Flying Service introduced a flag which was 2:3 in ratio, and there seems to have been two variants, the first shows the badge emblem placed upon a white background in a 'pear-shaped' fashion, and imposed on a sky-blue field. Michel Lupant, believes that this was up to the flag manufacturer's discretion, and until we have an 'eyeball witness' - I can only presume that both flags were equally official. Actually, the Hong Kong Auxiliary Air Force, created on 1 May 1949; became Royal Hong Kong Auxiliary Air Force in 1970. Originally, HKAAF aircrafts had RAF insignias, so I'd imagine the RAF Ensign would be used. Anyway, RHKAAF was granted a Squadron Standard by the Queen on June 8, 1972. Normally a standard is granted to a squadron after 25 years, but RHKAAF was granted a standard two years early for outstanding operations. The standard itself was designed by the College of Arms only in 1975. Unlike the usual RAF standards, it had a border and finial of golden chrysanthemums and silver five-pointed stars. It was 'laid up' at St. John's Cathedral on the disbandment of RHKAAF on April 1, 1993 (75th anniversary of RAF!). When I went there in December 1996, it was placed above the right-hand side of the chapel's entrance. 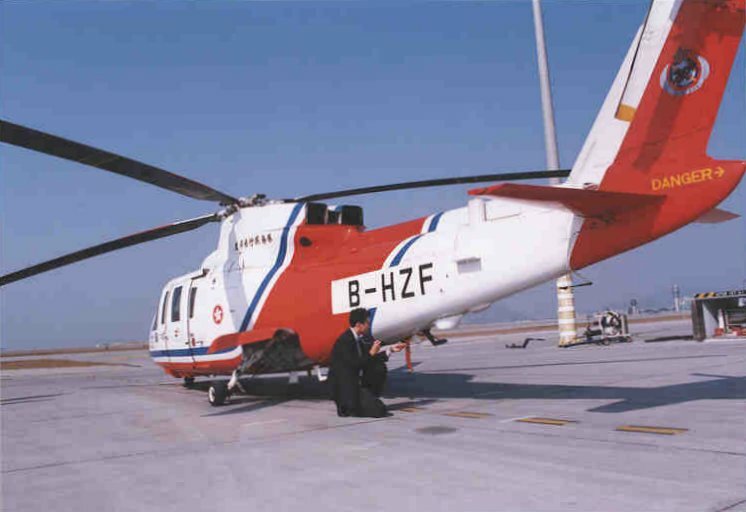 Hong Kong Government Flying Services since 1997 has used a roundel based on the Hong Kong flag in round shape as seen at http://www.info.gov.hk/cad/images/w4.jpg and http://www.geocities.com/cwlam2000hk/j41.jpg. The roundel can be seen at http://www.geocities.com/cwlam2000hk/7s.jpg. During the British period there was a Hong Kong Auxiliary Air Force which flew with RAF marking and emblem on the plane nose.